This article is about the human diet. For restriction of the human diet for weight loss, see Dieting. For a list of human diets, see List of diets. For a discussion of animal diets, see List of feeding behaviours. For other meanings, see Diet (disambiguation). A selection of plant-sourced food consumed by humans. The human diet can vary widely. Many people choose to forgo food from animal sources to varying degrees (e.g. flexitarianism, pescetarianism, vegetarianism, veganism) for health reasons, issues surrounding morality, or to reduce their personal impact on the environment, although some of the public assumptions about which diets have lower impacts are known to be incorrect. Raw foodism is another contemporary trend. These diets may require tuning or supplementation such as vitamins to meet ordinary nutritional needs. An eating disorder is a mental disorder that interferes with normal food consumption. It is defined by abnormal eating habits that may involve either insufficient or excessive diet. A healthy diet may improve or maintain optimal health. In developed countries, affluence enables unconstrained caloric intake and possibly inappropriate food choices. Health agencies recommend that people maintain a normal weight by limiting consumption of energy-dense foods and sugary drinks, eating plant-based food, limiting consumption of red and processed meat, and limiting alcohol intake. The Dietary Guidelines for Americans is an evidence-based information source that policy makers and health professionals use to advise the general public about healthy nutrition. ^ Some plants traditionally considered to be vegetables—such as tomatoes, eggplants, capsicums, and zucchinis—are permitted. ^ a b Plant seafood, such as seaweeds and microphytes, is permitted. ^ a b Locusts are sometimes permitted, depending on the religious denomination. ^ a b Most Pescetarians permit egg and dairy consumption or atleast one. 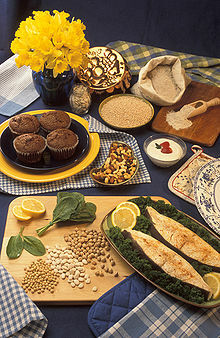 Ones with stricter rules, like “Seagans”, also reject eggs and dairy along with their rejection of poultry and red-meat. ^ Both ovo vegetarians and ovo-lacto vegetarians permit eggs. ^ Both lacto vegetarians and ovo-lacto vegetarians permit dairy. ^ Keown, Damien (26 August 2004). A Dictionary of Buddhism. Oxford University Press. p. 77. ISBN 9780191579172. ^ "Healthy Eating: How do you get started on healthy eating?". Webmd.com. 2009-10-12. Retrieved 2011-12-11. ^ "Policy and Action for Cancer Prevention Food, Nutrition, and Physical Activity" (PDF). World Cancer Research Fund & American Institute for Cancer Research. 2010.